The most popular notetaking and archiving utility around, Evernote has just pushed a major update to its Android app. Evernote 2.0 on Android provides all the utilities like its previous version including taking notes, shooting pics, record audio, making custom Notebooks and accessing them all from the cloud. Beside from the streamlined home screen, there are some noticeable enhancement in Evernote 2.0 for Android. The most crucial update brings in offline access for your notes. Rather than downloading all your notes, Evernote now caches all your data offline. Also by indexing additional data like tags, titles and thumbnail, Evernote 2.0 now allows you to search all your data quickly using a simple Google Phone search on your Android mobile. A minor feature update includes the persistent magnifying glass residing at the right side of the app, which lets you search for notes, accessing saved searches and for searching notes tagged with current geo-location data of user. Also included in the new version are offline notebooks for premium users. 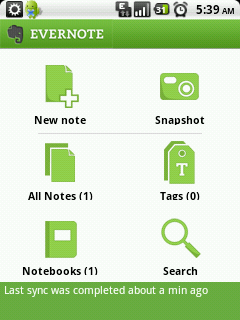 You can install Evernote 2.0 on your Android mobile by doing a quick search in the Marketplace.